Time is in short supply and the world is redefining the concept of work-life balance. We want to be involved in things that we care about, committed to our jobs but be more efficient, so we look for ways to streamline and minimise time spent on everyday activities. Universally recognised as an important aspect of a healthy work environment, maintaining a realistic work-life balance reduces stress and helps prevent burnout in the workplace. Maximising the use of time at work and in leisure has become a priority. Acknowledgment of the need for efficiency in everything we do has been a boost for the gift card industry, with the acceptance of gift cards as a time-saving way to manage the gift giving process. Previous generations would spend time considering and buying a gift for special occasions such as birthdays and anniversaries, hoping to please the recipient. Who wants to spend hours looking for an appropriate gift when the purchase can be made in minutes? A gift card removes the risk of buying something that the recipient doesn’t want. Today’s time-conscious generation looks to gift cards as the perfect gift. Not only does a gift card save time for the giver, it empowers the recipient to choose their own gift, giving them the ultimate choice and having the advantage of being regarded as ‘the perfect present’. What makes prepaid gift cards popular? Save time for the purchaser. Stay within budget, no surprise costs. Are welcomed by the recipient. Empower the recipient as they can be used for any purchase. Australians recognise the benefits of gift cards and in 2015 spent up to $2.5 billion on gift cards for family and friends. Most of us have received a gift card or given one as a present and know the pleasure it generates, both for the giver and the receiver. A 2012 government review into the Australian gift card market by the Commonwealth Consumer Affairs Advisory Council (CCAAC) found that consumers benefit when giving and receiving gift cards. They concluded that gift cards are ‘a market response to a consumer demand’, a convenient option for the gift giver and allow the gift card holder to select a gift that suits their needs. The popularity of prepaid gift cards is growing in Australia and has been identified by the corporate world as a useful and time-saving reward for staff incentive programs. Businesses committed to diversity in the workplace recognise that gift cards are remembered longer than cash awards and that gift card rewards are suitable for everyone as they are appreciated by employees of all ages. What Makes Corporate Prepaid Gift Cards Popular for Staff Incentive Programs? A reminder of your company every time they are used. As well as being the first choice for staff incentive programs, prepaid gift cards are the ideal consumer retention reward. Using gift cards as part of providing an excellent customer experience is key to increasing sales. What makes corporate prepaid gift cards popular for customer retention programs? Competition prizes and bonus gifts. Reducing product returns or exchanges. Customers with minor complaints can be impacted by time spent contacting your company on matters such as product replacement, service or delivery delays. A gift card as compensation for inconvenience can placate an annoyed customer and show them you recognise their time is valuable. Promoting the use of prepaid gift cards can also have the benefit of reducing product returns or exchanges. A customer’s positive experience receiving and using a gift card can have additional benefits for the business as once a customer has experienced the process, they are more likely to purchase from the company in the future. 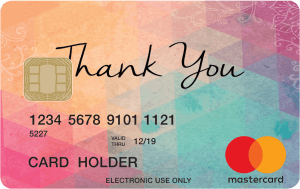 Corporate Prepaid Gift Cards offer a variety of generic Mastercard, Visa and eftpos cards as well as cards branded with your design for employee incentive programs and consumer promotions. You can design your card with your company branding and get the cards delivered within 10 working days. You can also have them packed in gift card wallets. All the details on how to use the card are included on the back of the wallet. For more information, contact www.corporateprepaidgiftcards.com.au on 1300 128 219, or email info@corporateprepaidgiftcards.com.au.